When I was in elementary school, one of my favorite things to eat was Zebra Cakes. They're one of life's greatest pleasures, provided for us by Little Debbie. I remember I ate them like most people eat Oreos-- I'd split them in half horizontally and lick the filling out. Yum! 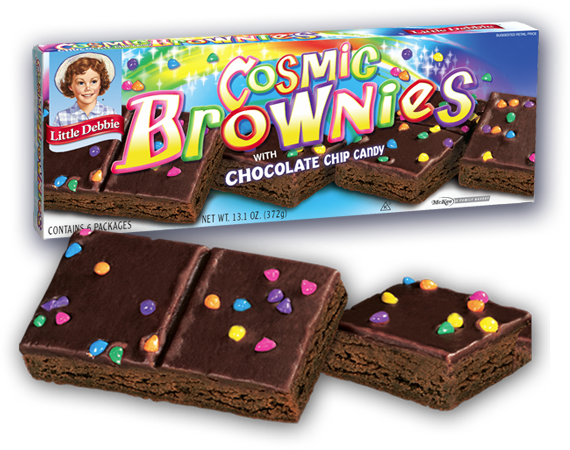 My husband's favorite Little Debbie snack has always been Cosmic Brownies. The best part about these is that they taste unbelievably fresh (as opposed to Little Debbie snacks which have been sitting on a shelf for who-knows-how-long)! No preservatives means they don't have the unmistakable chemicaly flavor. Recipe adapted from Life Made Simple Bakes. Candy-coated chocolate chips-- Wilton Rainbow Chip Crunch 5.25 oz. 1. Preheat oven to 350 degrees fahrenheit. Line a 9x13" pan with a piece of parchment paper and lightly grease. 2. In a stand mixer, combine melted butter, sugars, and vanilla. Beat on high for 4 minutes. Add eggs and beat again. 3. Combine dry ingredients (flour, cocoa, baking powder, cornstarch, and salt). Alternating with the milk, add dry ingredients to the butter/sugar mixture. Beat until just combined. 4. Spread evenly in the pan and bake for 18-24 minutes. Let brownies cool in the pan. These look amazing!!! I'm definitely trying this recipe.